Your family will love staying at The Harbour #17. 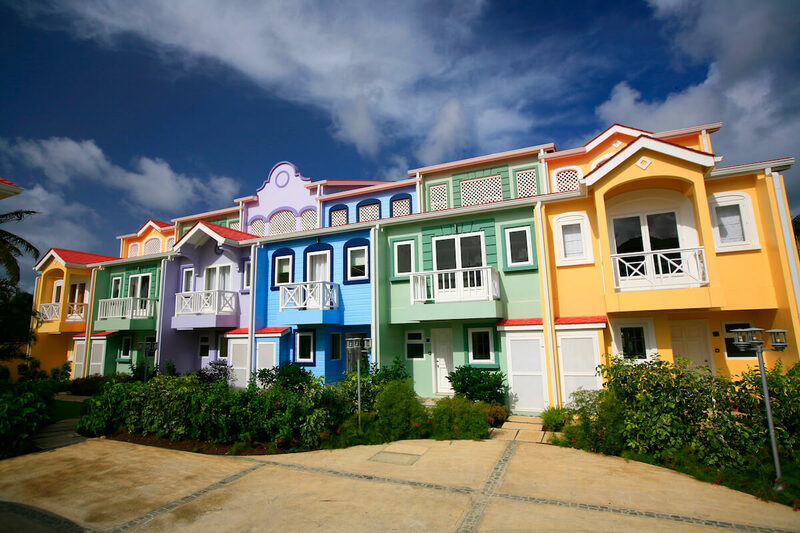 This brightly colored home is right on the harbor and nestled in the island’s most happening bay. You can walk to everything, which is perfect if you don’t want to drive! Located right in Rodney Bay, walkable to beaches, shopping, restaurants etc. The Harbour #17 is situated in Rodney Bay on the northern tip of St. Lucia. The open layout and convenient location is perfect for active families or three couples. The Harbour is situated in fully landscaped gardens with a swimming pool in the center. The marina is a short walk away, so guests can easily rent boats and water sports equipment. This unit’s balcony connects to the path leading to the marina, and has a living area and dining table with water views. The ground floor of this air-conditioned, three-bedroom townhouse features an open plan kitchen, dining, and living room. The spacious dining area blends into the living room and kitchen. The living room is equipped with cable TV, a DVD player, and a small study. There is also a powder room and laundry room for guests’ convenience. Two air-conditioned bedrooms are located on the first floor, and both have ensuite bathrooms. One suite offers a king bed while the second has two twin beds. The Master Suite on the second floor has a king bed and provides a modern ensuite bathroom. There’s a loft above the Master Suite that can accommodate two children on a sofa bed. All three suites open to the balcony or terrace. The Harbor #17 also has water sports equipment and housekeeping. The Harbour community is within easy walking distance of restaurants, bars, Reduit Beach, the JO’s Shopping Mall, and other local attractions. There are several beaches within a short drive as well. Bedroom 1: Second Floor - This master room also has a mezzanine with a sofa bed that can sleep 2 children. Easy walk to Reduit Beach. Great swimming beach. Other beaches are better for snorkeling.